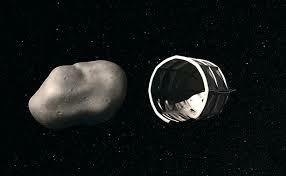 Asteroid dreams, Part 2: embrace the ARM! On May 31 the White House hosted a “We the Geeks” Google+ hangout on asteroids that featured a line-up of like-minded advocates for finding, exploring, and exploiting NEOs: Lori Garver, Deputy Administrator of NASA; Bill Nye, Executive Director of the Planetary Society; Ed Lu, CEO of the B612 Foundation; Peter Diamandis, cofounder and cochairman of Planetary Resources; and Jose Luis Galache, astronomer with the Minor Planets Center. Moderating this discussion was the White House Office of Science and Technology Policy’s assistant director for grand challenges, Cristin Dorgelo, who from 2006-2012 was vice president for prize operations for the X Prize Foundation, whose chairman and chief executive officer was and is Peter Diamandis. I found the Google Hangout to be a cheerleading session for the administration’s ARM proposal, B612, and Planetary Resources. You can watch it and judge for yourself. Bill Nye pitched the idea of using “laser bees” to nudge hazardous asteroids off orbital paths that could intersect with Earth. “Awesome,” Dorgelo responded. Ed Lu said B612 is “building the world’s most advanced detection telescope [to] launch in 2018.” “Awesome, very cool,” said Dorgelo. If we’re going to explore space, said Peter Diamandis, “we need to be dependent on resources in space.” The asteroid 1998 QE2 – which made a close approach to Earth at a distance of 3.5 million million miles on May 31 – “has a trillion liters of water on it…we’re talking about a multi-trillion-dollar object of value.” (I have not attempted to verify these claims.) “The only thing that’s drawn humanity to explore the world is the search for resources,” he noted. “We need to recognize the incredible role that space plays in unifying the world,” said Lori Garver. “It has literally, Bill, say it with me, changed the world.” Lu added, “I can’t think of anything more beautiful than to find an asteroid that’s going to hit us, and do something about it…. That will be a unifying moment, a turning point, in history.” Planetary Resources and B612 “will help humanity explore, exploit, and protect,” said Diamandis. “We need to get the public involved,” Diamandis continued. (See my previous post for information on Planetary Resources’ current crowd-funding campaign.) How should the public participate? Asked Dorgelo. By joining all the space advocacy groups* and contributing to all the crowd-funding campaigns to finance space projects, Garver responded. Call me dense, but I just didn’t “get” this event. I know the federal government traditionally has played a role in promoting new business development, I know the times they are a-changin’, and I know that geekdom is an important constituency for this administration (and certainly for the space program)… Nonetheless, it just doesn’t add up right to me. Maybe I’m just too darned old. « Asteroid dreams, Part 1: detect, deflect…exploit?